There’s nothing more satisfying than sitting down to a nice home-cooked meal. But when life is so busy, cooking tends to get sidelined. Who has the time to spend an hour standing over a hot stove stirring a stew, or to wait three hours for a roast? As much as many of us wish we could spend more time cooking healthy and diverse meals, it’s just too time-consuming. However, a pressure cooker may be the answer to your cooking conundrum. 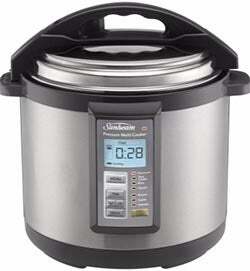 Pressure cookers can get the job done in far less time than conventional stovetop or oven cooking. You don’t even have to sacrifice flavour – in fact, pressure cooking can help lock in flavour. How does higher pressure just make things cook faster? Is it too good to be true? Read on to find out how pressure cookers work, and what products stand out from the crowd, with Canstar Blue’s review. Pressure cookers are kitchen devices that utilise steam pressure to rapidly cook food. An airtight seal keeps steam locked inside. As the steam builds up, this raises the pressure, which in turn raises the boiling point of the water inside to as high as 120°C. This high temperature means food cooks faster. The cook settings and other features vary between models. Most include accessories like a steamer basket, rice cup, spatula, ladle, and sometimes a trivet (to hold food above the liquid). What can you cook with a pressure cooker? Almost anything! 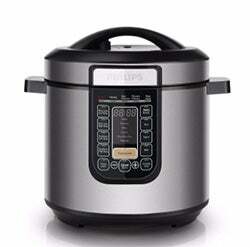 You can use a pressure cooker to cook any food to which you can add liquid, or can be cooked by steaming. 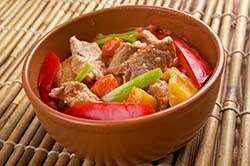 From rice to roasts, anything that you want to be tenderized or steamed or stewed can be easily cooked in a pressure cooker. If you’re feeling a little inventive, many food bloggers have found some unexpected things you can do with a pressure cooker, such as hard boiled eggs. What kinds of pressure cookers are there? 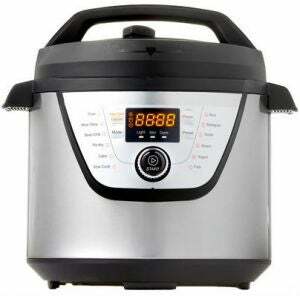 There are two main types of pressure cooker – stovetop and electric. Original pressure cookers were stovetop, while today the most popular type is electrical. Stovetop pressure cookers are quite rare these days. A relative might still have an older generation stovetop version in the back of their cupboard somewhere, and could still be getting great use out of it. If you’re looking to get a pressure cooker, though, it’s best to get a modern electrical one for optimal safety and efficacy. How do you use a pressure cooker? 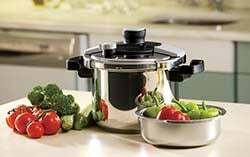 Many modern electric pressure cookers have a sauté option, which allows you to seal meat or sauté vegetables before putting the lid on and starting pressure cooking. As pressure cooking works using steam, you need to make sure there is enough liquid in the pan. Water or liquid stocks are the most common liquids to use. Place your food either in the liquid or above the liquid in a steaming basket. If you suspend the food above the liquid, there won’t be any flavour transfer from the liquid. If you do not have sufficient liquid, or use a liquid that’s too thick to steam (e.g. a thick sauce), then the food won’t cook properly and will probably just burn. Milk or oil cannot be used either. If you wish to make a thicker sauce from your cooking, it’s best to thicken sauces after pressure cooking. As there is some variation between brands and models, it’s vital that you carefully follow the instructions for your particular model. While the very first pressure cookers made back in the 50s and 60s were quite volatile, today’s pressure cookers are much more safely designed. There are a number of dos and don’ts of pressure cooking to make sure that you use the cooker safely. As long as you read and follow all of the instructions that come with your pressure cooker, you’ll have nothing to worry about. How much do pressure cookers cost? 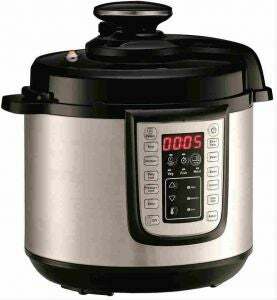 Where to buy pressure cookers in Australia? For the budget-conscious of us who don’t want to go without, Kmart’s Homemaker range makes household supplies far more affordable. Kmart’s pressure cooker has a capacity of 5.5L, with an 12 pre-set multi-function menu (including keep warm, slow cook and sauté functions) plus a 24 hour pre-set timer. With an LED screen, pressure indicator and safety guard, it’s easy to keep track of your cooking. Not bad for $69. 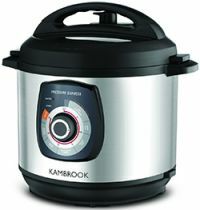 Dial up your dish with the simple control dial on the Kambrook Pressure Express. Just place your food in the 6L dishwasher-safe cooking bowl, turn to your preferred setting and leave the rest to the cooker. While the price tag of $99 is fairly cheap, Kambrook’s commitment to product testing isn’t, with over 500 hours of continuous testing conducted on the Pressure Express. Complete all cooking steps in just the one pot with the browning, sauté, and simmer settings, and never worry about dinner getting cold with the automatic keep warm setting. You can choose from low or high pressure cooking, and the automatic pressure release means there’s nothing for you to worry about during cooking. The 6L non-stick cooking pot and steaming basket are dishwasher safe, which makes cleaning up even easier. A more premium appliance, this Tefal pressure cooker will set you back around $220. This combination appliance can take care of a massive range of kitchen tasks. Choose slow cooking or sauté/sear with a low temperature and high temperature mode for each. You can also stew, bake or even prepare yoghurt in the 6L non-stick removable cooking bowl. 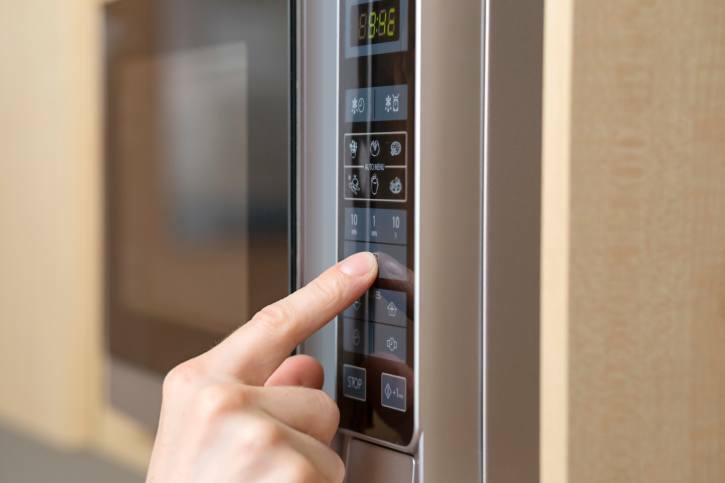 With the keep warm, reheat and pre-set timers rounding out your controls, with just one appliance you can do the work of many. The automatic pressure release valve keeps the process under control without needing human help. The easy to detach inner lid makes cleaning a breeze, but you’ll need to pay a premium price for this Philips pressure cooker, roughly $240. Accessories included are a plastic steam tray, measuring cup, spatula and ladle. Taking your cooking to the next level requires finesse and carefully controlled cooking environments – plus about $350 for this Breville pressure cooker. The Fast Slow Pro makes fine-tuned cooking easy, as it can automatically adjust the time, temperature and pressure to get your dish just right, thanks to sensors at both the top and bottom of the cooker. The automatic steam release varies depending on the type of food being cooked, for ideal taste and texture. With a full range of pre-set functions including reduce, sauté, sear and steam, the Fast Slow Pro has your food well covered. 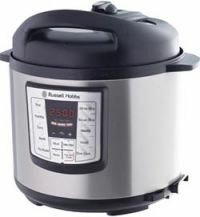 With this Russell Hobbs pressure cooker, you can choose from 10 ‘Intelli-tech’ pre-programmed settings (such as ‘Curry’ or ‘Pudding’) to cook your meal with just the push of a button, or manually set your own cooking time. The ‘Delay Start’ and ‘Keep Warm’ settings make it easier to completely control your meal preparation. With a 6L capacity removable non-stick bowl and easy to read countdown timer, the Express Chef, priced at $199, also comes with a trivet, serving spoon and soup ladle. 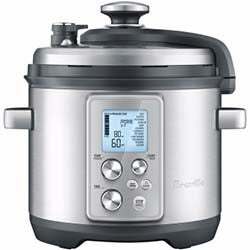 Should I buy a pressure cooker? As a pressure cooker is a bit of an investment, it’s important to consider the pros and cons and your personal cooking needs and habits before purchasing one. As cooking time is shorter, you lose fewer vitamins and minerals in the cooking process. Fewer nutrients will be dissolved away by water as happens when boiling food in large amounts of water. Cooking occurs at a temperature above the normal boiling point of water, so most microorganisms are killed. Uses less liquid than boiling or conventional steaming. Far more energy efficient than using an oven or stovetop. Requires more cleaning and maintenance, particularly around the gasket (sealing ring) which requires replacement every year or so. It’s harder to inspect the cooking process, as you can’t just pop the lid off for a quick look without completely stopping the cooking process. This means keeping close track of cooking time is very important, particularly as cooking happens so quickly. Much more expensive than a regular pot or saucepan, so you’re mostly paying for the effort and time savings. There’s a learning curve – you’ll need to carefully follow instructions and recipes designed specifically for pressure cookers. It’ll take a bit of trial and error to get the hang of it. Whether you take the plunge into pressure-cooking or not, we hope you find this guide helpful.